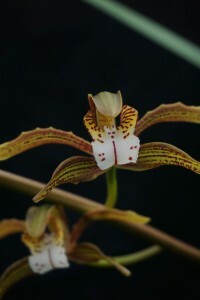 Today’s Orchid is another Cymbidium from the Sikkim Himalaya. Students on our school expeditions to Sikkim have seen this graceful species growing in large evergreen trees at around 2000m altitude around Gangtok and in Southern Sikkim near Tinkitam. 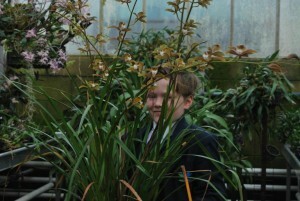 Cymbidium erythraeum is a lovely orchid when not in flower due to its long thin dark green leaves. The flower spikes emerge in the autumn and the long lasting flowers are a treat throughout the winter. Our biggest plant is now quite a specimen (it nearly hides Joe in the photo) and it has five long spikes each with more than twenty flowers. This is our tall growing clone. We also have clones which produce shorter leaves and shorter spikes than this clone but these are equally as graceful and worth growing. We grow this plant close to our Cymbidium hookerianum plants with a winter minimum of 6C and vents that open at 10C so it grows really cool. We keep it very wet in summer with plant food in most waterings. In the winter we keep it damp and never let it completely dry out.